This is a highlights and summary post. I intend to publish some additional posts on specific locations. All of these posts are made after the fact. I took some notes on the cruise but didn't want to spend that precious time pecking away on the keyboard for hours every day. Summer Cruise 2013, destination Desolation Sound, was a big success overall and achieved all primary objectives. Northbound strait crossings were all uneventful, we had plenty of ideal weather, crowds were manageable, no major equipment failures, no docking mishaps, and Desolation Sound lived up to its reputation as a cruising mecca. There were some low points. The weather was mostly perfect, but did leave us cooped up in rain for several days. We had one rough crossing of the Strait of Georgia on the return delivery. We all learned things about how long we can spend happily eating, pooping, and sleeping all together within a 10 foot radius. But overall we experienced some unique and beautiful places together as a family. Everyone appreciated the natural beauty of the setting, the wildlife, and most of all the warm water and swimming. I harbored some concerns over planning a trip during the peak month for visitors. Family and school schedules and other summer time commitments pretty much boxed us into August. With that said, the crowds were really not so bad. I had a "plan B" for every stop, but never had to implement any of them. Prideaux Haven was by far the most crowded, but even then we really didn't have any trouble finding a nice stern tie spot to anchor in Melanie Cove. Docks rarely filled at night. Part of our success has to be attributed to my "depart early and arrive just as others are leaving" strategy. Tenedos Bay for the combo of 70 degree salt water swimming and even warmer lake swimming, and low crowd factor/good privacy. Biggest Pleasant Surprise: The mexican restaurant on the dock at Nanaimo. First ever Canadian mexican food sans cheddar. Port of Nanaimo gets honorable mention for having the most non-obvious but mind-blowing and unique design approach: no spigots or water control of any kind, just a pure blast of hot high pressure water. Downside is that 3 minutes is a bit short. Refuge Cove's $5 no time limit shower was the best shower of all. So much water pressure I couldn't run it on full. No time limit. No line. Just pure awesome. The price is at the high end but it is not like these guys are just plugged into some municipal plumbing system. The "living the dream" award goes to Kyle and family who run the Toba Wildernest Resort at the entrance to Toba Inlet. Completely off the grid, self sufficient on power with custom hydroelectric and water from a beautiful waterfall. Deep waters mean there is no place to anchor anywhere nearby, and these guys can only accomodate 6 - 7 boats on their docks. It is a beautiful setting with nobody else around for miles and miles. It is easy to romanticize this lifestyle, but I'm sure there are dark days during October - April! Elizabeth's favorite was Refuge Cove for the unusual setting, shower, and great wifi. Pat and Kim's favorite was Toba Wildernest Resort for its truly unique and rugged setting, and the entertaining opinions on marine guidebooks from Kyle the proprietor. No question, Lund wins this one hands down. Great showers, wide well-maintained docks, helpful staff focused on the needs of the summer cruising crowd, and the price couldn't be beat. $33 including power! The one area where they seriously fall short is wifi. Fortunately there are enough business on shore filling this gap, plus I got a solid signal on the Koodo Mobile prepaid SIM I bought for the trip so we could have data in situations like this. Not much. The main cabin Caframo ventilation fan failed, but the failure was just in the speed controller. A soldering iron, some spare wire, and a switch allowed me to bypass the controller and get it running again. The Jabsco freshwater plumbing pump failed, but...I had a spare! I enjoyed that special feeling you get when a mint in box spare you tucked away 3 years ago pays off. I regretted not changing the head's joker valve before we left. We saw about 8 ounces of "backwash" throughout the trip. Not a huge deal as long as everyone remembered to finish the flush with a few cups of water, but apparently that is too much to ask! I wanted to get a replacement in Nanaimo, but the chandlery was closed for the BC Day Holiday during our visit. Pretty much everything else worked flawlessly, including the most critical components such as ground tackle and windlass and most of all, the mighty Volvo D1-30 Diesel Auxiliary Engine. The new wifi system with a Bullet M2 antenna/access point coupled with an onboard router worked very well to share wifi across all of our devices. Navigation planning with the open source OpenCPN software was a huge time saver. I uploaded routes directly to my Garmin chartplotter using a USB to serial adapter. New sunshade. I've come to accept that the sunshade that came with the boat is not all that well designed. We saw some nice sinple designs for mounting from the boom to the backstay. Shorter holding tank discharge to a new deck pumpout location. Eliminating some low points in the current discharge hose routing should eliminate the last vestiges of "head smell." New fridge and fridge box insulation: the fridge remains our biggest amp hour sucker, and it seemed to be feebing out on us a bit during some of our hot days, necesitating ice block supplemental cooling. And it makes annoying noises. I will be checking out keel coolers vs. holding plate technologies. Stay tuned for more detailed location-specific posts! It involves a double boiler and takes more than a day what with the need for stuff to chill and all. 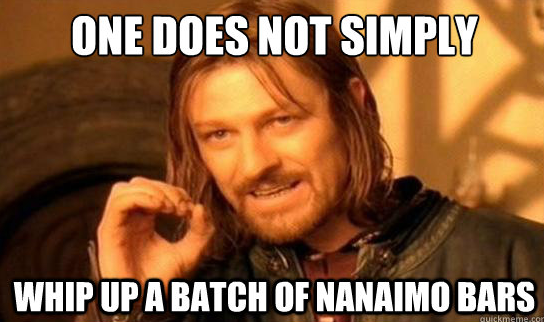 Fortunately we are taking a layday in Nanaimo for provisioning, which affords us the opportunity to take a journey on the Nanaimo Bar Trail (no I did not just make that up, check the link to the Nanaimo Tourism office site for all of the details and a map) in search of the platonic ideal, the ur-bar. The first bar comes from Javawocky and seems to be a great example of the traditional preparation. Much thicker than the bars from Ken's, but I was expecting that. The coconut us discernible, the custard layer creamy and thick, and it looks like it has walnuts. The official recipe calls for almonds, but I think I might prefer the walnuts. Overall, a great bar and no complaints! On another note, I found the drip coffee from Javawocky insipid and weak. 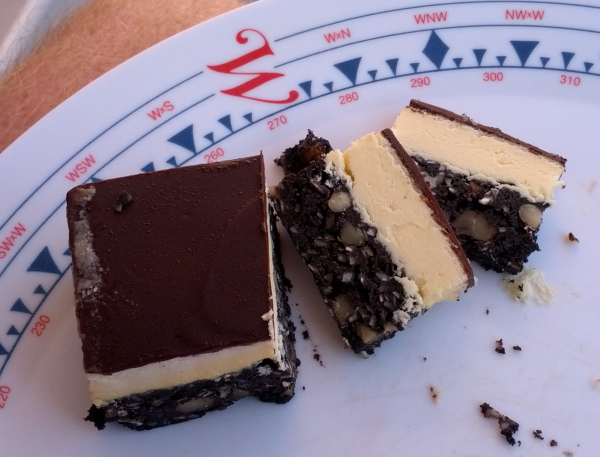 This was supposed to be a long post wherein I described in detail the virtues and shortcomings of a dozen or so different Nanaimo bars....but it was too darn hot! The thought of pounding the hot pavement and scarfing down sugary confections became more and more nauseating as the temperature climbed. I will say that the Nanaimo bar gelato at the gelato shop on the esplanade is delightful though. Elizabeth and I both enjoyed it very much. This will be a quick note on our customs experience this year. We cleared at Bedwell Harbor, the scene of my serious tongue lashing two years ago for having wayyyy more alcohol on board than I declared, and more than I even knew I had thanks to my crew of 4 other 40-somethings each of whom had brought wine, liquor, and beer on board. That experience was my "scared straight" turning point. Now I meticulously inventory and declare everything. This year was different. it had to be the most streamlined checkin ever. Maybe they figure they have us on file now, or maybe crossing with your family sets off fewer warning flags than five 40-somethings. I was asked for my vessel registration number, after which they indicated they had the whole family already on record and didn't even ask for passport numbers, dates of birth, or anything. On the subject of alcohol, they did not ask about the quantity, which was a first. The question was simply "is it staying on board the boat?" Apples and potatoes are still verboten, which was expected. On a tangential note, after transiting Cattle Pass we had the pleasure of a little on the water interrogation courtesy of the young men at US Homeland Security. As I was preparing flapjacks in the galley and Elizabeth was keep a less-than-sharp lookout, a DHS patrol boat snuck up on us and alerted us to their presence with a quick "bloop" of their siren. there are many things on the boat that can set off alarms and we don't get to hear them often, so sounds like this usually freak us out. After determining the source of the alarm was our tax dollars at work, we went through a rapid fire Q&A session before being released to go about our business. Thanks for keeping us safe. Right. Most of this summer's sewing projects are in support of the boat's new second/backup anchor. I purchased a Fortress FX-23 anchor on eBay. Fortress anchors are great as backup anchors because they are light and they disassemble to simplify storage. My first project was to make a storage bag for the Fortress. Fortress sells one, but it costs a bundle, almost as much as the used anchor, and after all it is just a bag. So I made one. It has custom fit inner pockets for each piece of the anchor, as well as a little tool pouch for a 1/2" wrench to aid assembly. Next came a custom bag for the rode, 200 feet of line and 30 feet of chain. I read on...I think it was the Starzingers' web site...about their approach for storing a long stern-tie line: put it in a long skinny bag. Because the bag is skinny, the line doesn't tend to kink up or get snarled when spooling in or out. So I made two long skinny bags from some cool synthetic mesh material I picked up at Seattle Fabrics: one for the stern tie and one for the backup rode. Line will dry out in the bag, and it is tough stuff. Kim is unconvinced the bag approach is the right way to go. We have a short stern tie line, maybe 150 feet, on an extension cord reel. It is still kind of a hassle to deal with reeling it in in such a way that the line doesn't bunch up on one side or the other. Given that we are going to Desolation Sound this summer where stern ties are de riguer, I invested in a longer line. I just bought a whole 600' spool. Way overkill, but hey it is cheaper by the spool. For starters we will try managing it on the spool with a boat hook as a spindle across the cockpit seats. I have a hunch that is going to work about twice and then we will go for the bag. The one thing I can't seem to get nailed is a simple drawstring closure. I can sew it up fine, or at least I think it is fine, but the darn drawstring always binds up and doesn't really slide through its sleeve smoothly to culminate in a nice tight closure like I envisioned (and like every commercial drawstring works). Maybe I need to pin down the "bitter end" of the drawstring within the sleeve rather than leeving it as a continuous loop? I have no idea, but whatever I am doing is unsatisfactory. Of course these are all "small boat" compromises. The real solution is to jump up to an Amphitrite, amiright? Big boats have their second anchors ready to go on the sprit, and they also have a stern anchor ready to launch from a stern rail mount, and they have fancy dedicated permanently mounted reels for stern tie lines too. But that is a cliff I am not going to jump off of. It is easy to admire these skookum bulletproof gear setups on bigger boats, just as it is easy to overlook everything else that goes with a bigger boat. Not gonna do it. I took Cathy to see Pacific Northwest Ballet's Nutcracker last night. I know some families go to this every year, but for us it is more of a once-and-done event due to the cost if nothing else. I would rather mix things up and go see A Christmas Carol or some other holiday themed performance that go to the Nutcracker every year. I took Elizabeth when she was about Cathy's age, after which we had our fateful and nauseating dinner at the Space Needle, an experience not to be repeated! So this is a review of sorts, but I am not qualified to weigh in on the subtle changes made each year, and I am not the Nutcracker expert I know some of our friends are. We sat in the orchestra section, which is not cheap, and I consider it a special event and not an annual tradition. I enjoy the music, and it is always fun to see the dancers of all ages performing. It is really hard to go wrong with the PNB Nutcracker. The set designed by Maurice Sendak is a treat and local treasure. The music was great. I love the music of the Nutcracker. It is so ubiquitous at the holidays and remains enjoyable from year to year. We took a peek at the orchestra pit before the performance, something I highly recommend if you are taking a child who hasn't seen a ballet or theatrical performance with live music before. The performance was...OK I guess. It was definitely not the best Nutcracker I've seen. The music was good, the audience was well behaved, the set and set mechanics were wonderful as always. There were several flubs which given the nature of the Nutcracker and how many children are in it are all par for the course. The peacock fell down. The Chinese tiger fell down. A little boy lost his ballet slipper and valiantly tried to continue dancing, hopping on one foot while trying to get the slipper back on the other before finally giving up and finishing the scene without it. Individually these are all forgivable but the cumulative effect is...well it is still forgivable but was definitely distracting. My big beef (you knew it was coming!) is with the treatment of the Drosselmeyer character. Drosselmeyer is the defining character of the Nutcracker. In my opinion he is probably the only character who really has a personality and room for directorial interpretation. The rest of the players are all very two-dimensional. Boys will be boys and play with guns and swords. Girls will be girls and play with dolls. Drosselmeyer however, with his offputting eyepatch and magical powers to bring toys to life, is the character who puts the whole story into motion. IMDB has an interesting article on the character and some history of how the character is portrayed in different productions. It even references the opening season of PNB's Nutcracker where he was dark and ominous, the way he should be! While I remain very grateful that I have never seen what IMDB calls a "dirty old man" Drosselmeye (eww, yuck, that is just plain wrong and horrifying), I have always understood him to be a slightly frightening character. Why else does he have that eyepatch?! He should be forbidding and powerful, but still kindly. He has supernatural powers, but he also gives delightful gifts and brings things to life with his magic. I was quite disappointed that PNB chose to portray Drosselmeyer as a bumbling and dottering Mr. Magoo-like fool who was often a bit stooped over and surprised at what was happening around him. He gets pulled this way and that by the party-goers and does not seem wholly in control of his own faculties. This is a guy you chuckle about after the party, not one that makes small children simultaneously apprehensive and delighted. What is even more odd is the way they played Drosselmeyer with the boys, goading them on to tease and taunt Clara with the rat king doll. So not only is he a bumbling fool, but he is a spiteful one too who purposely sets the boys on the path of mischief-making multiple times. He comes off as both mean and foolish. This is a character to be scorned and dismissed. All of this reminds me of the controversy that erupted among die-hard Tolkien fans over departures from canon in Peter Jackson's films, particularly the scene where Gandalf bumps his head in Bilbo's hobbit hole. Critics state (correctly) that this never happened in the book, and that it makes Gandalf look like a bit of a fool. Others say it humanized the character. Maybe that is what PNB was thinking with Drosselmeyer: make him more humorous and approachable. Well...Gandalf isn't human, he is a wizard, and is one of the most powerful characters in Middle Earth. "Approachable" isn't supposed to be one of the top adjectives to describe him, and I argue it isn't doing Drosselmeyer or the production any favors to humanize his character either. And another thing: the nutcracker gift to Clara wasn't even a proper nutcracker! It was a stuffed doll. Whatever. You lost me with this PNB. Too cutesy. Well that's it. That's my ballet review. I will leave you now so I can go off and ponder what is happening that has brought my life to the point where I am reviewing ballet. Addendum: I had the chance to chat with my friend Jennifer about the performance. Jennifer danced in the first season PNB did the Nutcracker with the Sendak sets, and has attended more than 30 PNB Nutcracker performances, including the performance earlier the same day as the one Cathy and I saw. She informed me that the dancer playing Drosselmeyer in the performance we saw is a known ham who typically overplays any opportunity to insert comedic elements into his performance, so we had the worst of this flavor of Drosselmeyer. She was also shocked! to hear that the peacock fell...something she has never witnessed.